Today, United Airlines’ first Boeing 787-10 Dreamliner began regular service as UA2418, departing from Los Angeles International Airport traveling to Newark Liberty International Airport. United is the first carrier in the world to operate all three Dreamliner models, including the 787-8, 787-9 and now the longest model, the 787-10. The Dreamliner’s entry into scheduled service continues United’s comprehensive fleet plan, while providing an improved experience for customers. The aircraft is United’s first Dreamliner model delivered with the airline’s signature Polaris business class seats, and new United® Premium Plus seats. Boeing’s Dreamliners are known for dramatically improving the on board experience for customers with lower cabin altitude, better humidity, cleaner air, smoother ride and better sound quality. Additionally, the new Dreamliner provides better fuel efficiency than older aircraft, contributing to United’s commitment to reducing emissions by 50 percent by 2050. As previously announced, United expects its second Dreamliner to enter service between its hubs in San Francisco and New York/Newark in February, and begin international service in March. 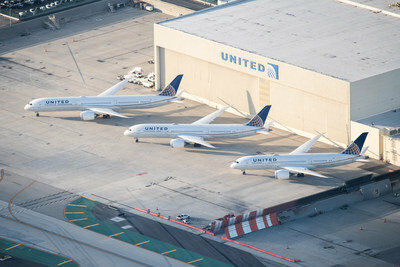 For more information on United’s 787-10, and other fleet updates visit United’s Fleet Newsroom.